Covenant Relationships: The Cosmopolitan Parents Guide To Family Fun! Contrary to what we are wired to think, Saturday and Sunday are the most important days of all, they are the days the weekday work should be catering for. So put away the to-do list and get out that tablet for a bit of Cosmopolitan family fun. Nintendo Wii - This is a bit pricey but gone are the days when video games rot the mind and body. 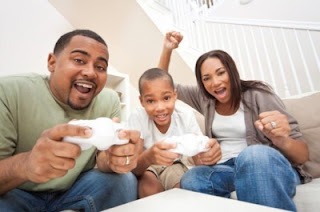 The Nintendo Wii for example has been hailed as a great family gaming system because most of its games are kid-friendly, the controls are intuitive and it can get everyone up and moving—not something you’d expect from a next-gen gaming system. Try Wii degree or Mario Party 8. Mario Party 8 is like a board game turned into a video game. Baking - Make cupcakes, muffins, cookies, or try something new! If you can't bake look for a simple cake recipe online and try it out together (keep Andrews liver-salts nearby). Do arts and crafts - There are plenty of arts and crafts ideas, such as beading for your girls, candle making, building a birdhouse, sewing, knitting, clay projects, and much more. Taboo - This is a personal favorite. Basically, you divide yourselves into teams and get teammates to say the phrase on the card without using any of the Taboo words. It's a game of unspeakable fun. To get your team to say "rice", you can't say "food" because it's too obvious, "white grain", "jolloff" or "what does stew go with"? . Rattle off clues while the time counts down. You'll earn a point each time your team guesses correctly. But watch what you say. If your opponents hear a Taboo word, you'll get buzzed and they'll get the point! Android tablets and iPad have a downloadable version. Personality Quiz -Write down some random questions and have everyone answer them for another member of the family. Noah's Ark - Noah says: You have all been invited to come on the Ark, but there are only certain things that you can take with you. Take turns around in a circle and call out what you would like to bring . Pam may want to bring some pancakes that would be great to eat; Joey may think that's a great idea and want to bring some syrup with it but he can't. But he can bring some jam; whereas Susan can bring some syrup. The goal of the game is to bring items only that start with the first letter in your name. The players will not get it at first and you may need to do a few rounds. (Make sure players only bring one item at a time as they go around the circle). Players who figure it out should be told not to say anything. Gospel Says - it is like "Simon Says" except you ask the players to do things that are in the scriptures. Button, Button, Who Has the Button? - For those who may not know the game, I will explain. All you need is a button. Everybody sits in a circle. One person in the middle is 'IT'. The button gets passed around in a concealed manner. Of course, one person must hold onto the button without passing it. The others must pretend they are passing it. After all have passed (or not) 'IT' must point out the person with the button. That person becomes 'IT'. There are so many more but let me stop here. If you have teenagers who always want to go out with friends, it might be because they are really bored at home. So we should find ways to engage them and have fun in the process.